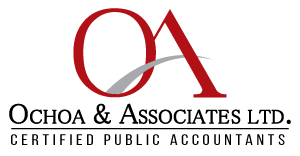 Individual Taxes – Ochoa & Associates LTD. There's no reason to overpay in taxes or to struggle to handle any financial - related matter. With more than 10 years of experience, our local tax firm is ready to guide you through any personal tax concerns you have, where you just need help filing or you need to work on those back taxes. Work with us to get fast, reliable service. Relax and let the professionals handle it and ensure you get the most out of your tax return. We are licensed with a Certified Public Accountant.